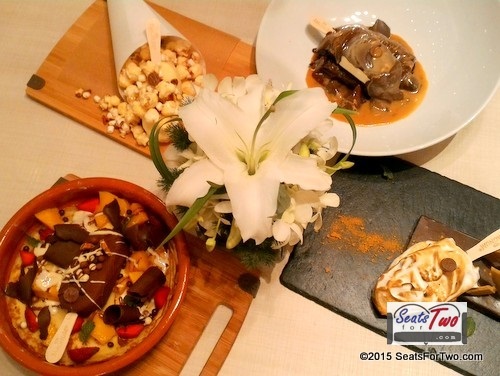 Magnum Manila, the House of Pure Pleasure and our favorite make-your-own ice cream pop-up store is closing very soon, July 26, 2015 to be exact. 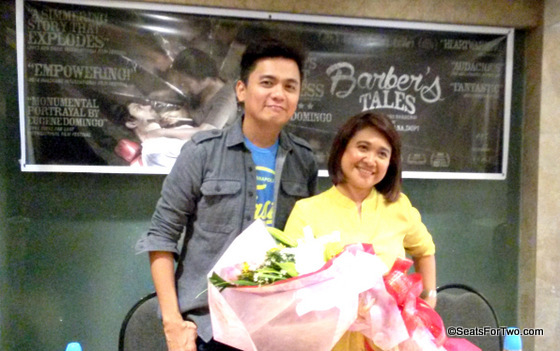 Since it opened last April 2014, Seats For Two has dined-in a couple of times. 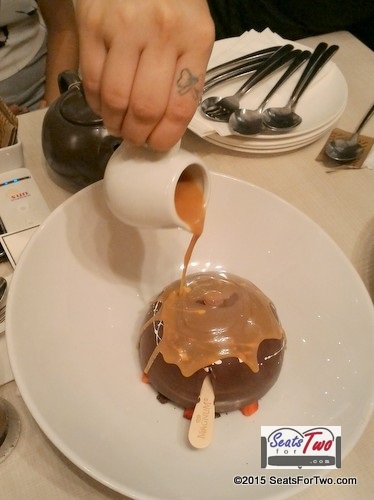 We can say it’s one of the best dessert houses in the country. Imagine, you can make-your-own Magnum Ice Cream for only P100 that comes with your choice of toppings. Unfortunately, some things never last. Magnum Manila will soon closes its door. So before waving our goodbyes, we got a taste of their five (5) new Magnum Creations. We started with Cajun Spiced Chicken Poppers (P180 / US $4) which is not really spicy and has a little sweetness care of the spiced honey and white bacon gravy. 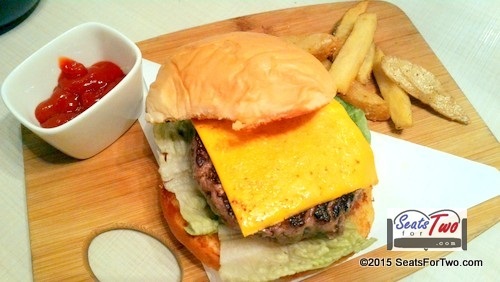 Hubby Jonel had a huge serving of Magnum Burger (P400 / US $9), a special Wagyu burger topped with cheddar cheese, underneath are lettuce, tomatoes and special sauce. It comes with potato fries on the side as well. 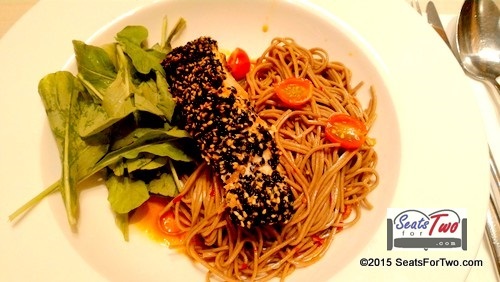 I had my favorite Salmon Soba. I remembered ordering the same dish the last time we were here. Who would say no to salmon anyway? 🙂 The cold noodles was tasty and cooked just the way I wanted. Fresh arugula complements with Salmon. I will definitely miss it. Although it saddens us to say to goodbye to Magnum Manila. We were glad to have five (5) new addition to the Magnum desserts. 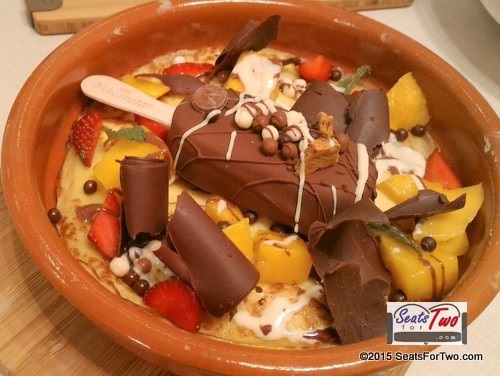 Starting off with Crepe de Jour, a soft crepe topped with Magnum bar, chocolate shavings, some mangoes and strawberries. 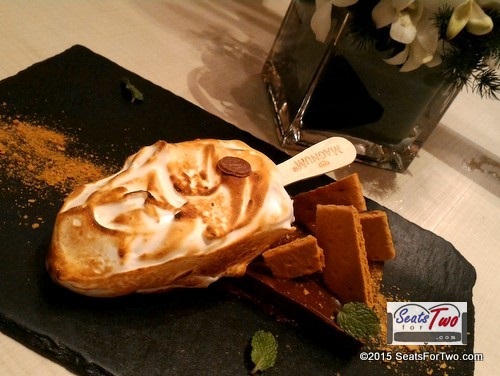 Next, toasted marshmallows cover a Magnum Bar served with graham crackers on the side is the Campfire S’Mores. The third one really popped! Although I’ve seen a lot of desserts made out of pop corn, the Magnum Popcorn is still recommended for people who loves popcorn. 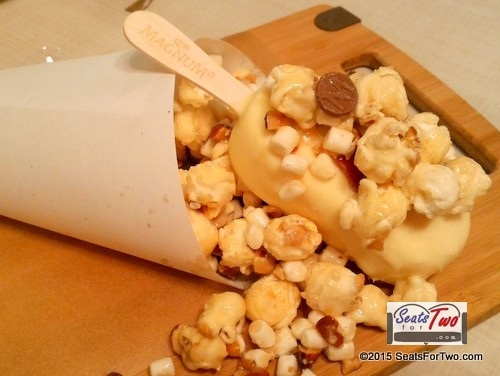 It’s a Magnum Bar served with sweet popcorn and mallows. The fourth will melt your heart. 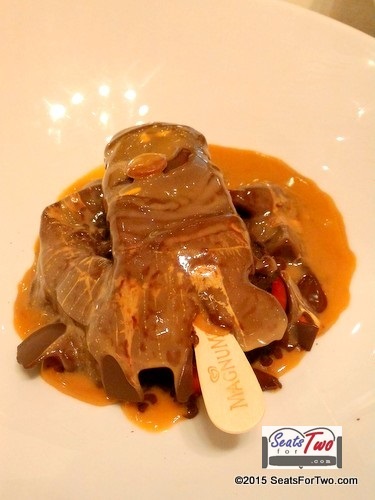 Make My Heart Melt is magnum covered with frozen chocolate and topped with caramel syrup upon serving. Check out the next photo and find out why it’s called “Make My Heart Melt“. Last but definitely not the least, my favorite was the Magnum Anniversary Cake. 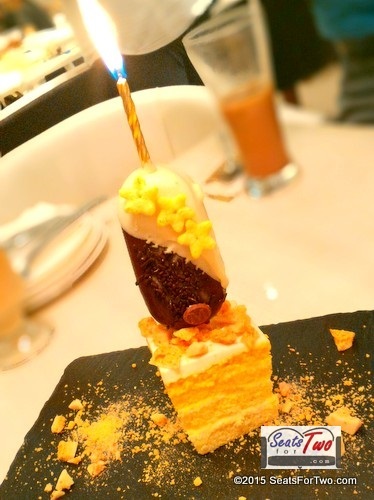 On top is a lighted, golden candle and a cake at the bottom. Truly, a beautiful gift for your partner as it sets the mood for romance. It could be a pretty surprise to your loved one on your special day, so I recommend you visit Magnum Manila before July 26, closing time.